This is a walkthru guide for Covert Front Episode 2, a point-and-click mystery adventure game that will transport you to the center of an espionage-filled world. 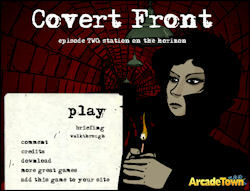 In Covert Front 2:Station on the Horizon, our top secret agent Kara is up to her neck in hot water. Having infiltrated Karl von Toten's mansion and made off with key intelligence, she must now escape with her life and let her superiors know of her shocking finds. Light a match (pick up lighter and click anywhere on the screen). Go forward until you face a brown brick wall. Push the three bricks that are sticking out of the wall. Go left, and press the button on the machine. The light will turn on. Pick up "Resistor 1" sitting on top of the machine. Go back to the screen before the brick wall, and go left into the tunnel. Go in both directions, left and right, find "Resistor 3" in the right tunnel and pull the switch in the left tunnel. Go back to the round red brick sewer entrance. Go inside and go forward until you enter another area with two more tunnels. Explore both tunnels until you find both "Fuse" and "Movie Reel 2". Go back to the screen where you see both tunnels, and turn right. Enter this new area. In the hallway with five doors, enter the two on the right wall and collect "Cable" and "Piece of Wire". Enter the closer door on the left wall in the main hall. Click to zoom in on the toolbox and collect "Screwdriver". Zoom on the electric power box on the wall, then unscrew all four screws using "Screwdriver". Use "Fuse", "Resistor 1", "Resistor 3" and "Piece of Wire" here, then pull the lever. Go to the other door on the left wall of main hall. Zoom in on the machine next to the keyboard (click on the small square plate) and then unscrew the plate with "tr-p-bl" writing on it using "Screwdriver". Use "Cable" here. Watch cut scene and then approve Kara’s message by clicking "Send" button. In the radio room click the button on the machine that is now blinking. Zoom on the printout and memorize the numbers. Go back to the main hall and go forward through the center door. Click on the keypad next to the closed door and enter the code you memorized. The keys are not in a standard sequence so you'll need to use trial and error until you learn which keys are which. Go in and collect "Movie Reel 3". Exit and go through the opposite door to the Projector Room. Click the green button on the machine holding another movie reel and collect "Movie Reel 1". Put "Movie Reel 3" into the projector and watch the movie. You will see the combination for the main door lock that is just outside this room. This goes by quickly so you may want to take a screenshot to help you remember! You can watch other movies as well here, just make sure that as you leave, you have all three movie reels back in your inventory. Leave the projector room and on the main lock on the wall enter the code you've seen on the "Movie Reel 3". Go back to the red sewer tunnels and find the elevator. Enter the elevator and turn right. Push the button and watch the cut scene. As the car stops and rolls down the window - use all items left in your inventory on the window. Collect the "Card" then click on it to see the final cutscene.